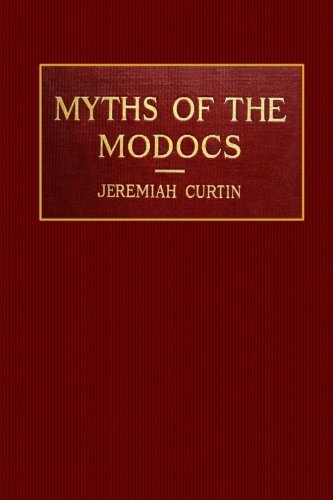 Amazon.com description: Product Description: This is another posthumous work by that remarkable linguist and anthropologist, Jeremiah Curtin, whose translations of Sienkiewicz's novels were merely byplays in the midst of his strenuous lifework. He collected nearly fifty legends and stories of the Modocs, many of them from a squaw, after the tribe had been suppressed and exiled. Other stories he heard when he himself visited the Modocs in the Klamath country. They are written in Curtin's well-known clear and vigorous vein, and their great variety not only enhances the interest of the collection for the general reader but for the student of comparative folk-lore. They add valuable material to that store, already large, which awaits the coming of a master mind to digest, compare, and coordinate the myths of the American Indian. Curtin himself, had his life been spared, and had he not had so intense a passion for exploring, discovering, and recording, might have produced such a work.